The model CPA2501 air data test indicator is used in aviation and aerospace applications for calibration of altimeters and airspeed indicators, displaying altitude, airspeed, altitude rate (vertical airspeed) and airspeed rate (acceleration). Applied wherever there is a need for a high level of accuracy in an avionics indicator or calibration instrument. 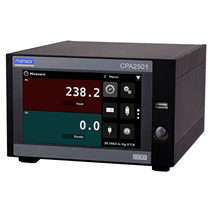 The CPA2501 can be configured with an altitude channel and an airspeed channel consisting of Ps/Pt or Ps/Qc. It can be configured as a single-channel altitude/altitude rate indicator, (Ps only) a single-channel airspeed/airspeed rate indicator (Qc only) or it can be a dual-channel unit configured as Ps/Pt or Ps/Qc. In the Ps/Pt version the airspeed/airspeed rate channel is a calculated channel. An optional barometer can be installed for display in the front panel or as a separate channel. Pressure ranges for each channel can be specified by the customer. An optional barometric sensor can be added to any version. The manual user interface is through a widescreen display with touchscreen. Navigation within the intuitive menu structure is easily learned. Recognisable touchscreen icons open screens for configuration and calibration. Communicating to a remote computer is achieved through RS-232, IEEE-488, USB or Ethernet. Communication commands are the same as the previous version of Mensor avionics gauge models 2108 and 2109 or the WIKA command set “SCPI”.